Historically cursive was taught first to our nation’s children. Today, reading and dyslexia experts are rediscovering that teaching cursive first–before print or manuscript–improves long-term penmanship skills, helps children learn to read, virtually eliminates reversals, and enables children to read what is written by others. Cursive First introduces children to writing numerals, the cursive alphabet, and the most common phonograms of the English language. The package coordinates with the instruction found in the highly successful Spell to Write and Read and The WISE Guide by Wanda Sanseri, and can be used with the beginning writer or an older student transitioning from print to cursive. You can read an abridged version of the first chapter from Cursive First on the rationales for teaching cursive as the initial penmanship here. What’s included in Cursive First? is printed on yellow card stock to differentiate them from other phonogram or spelling rule cards. These cards help your student read and write the letters that make up the written language we call English. If you have the Core Teacher’s Kit for SWR, you will already have these cards, so all you’d need is the Cursive First package. 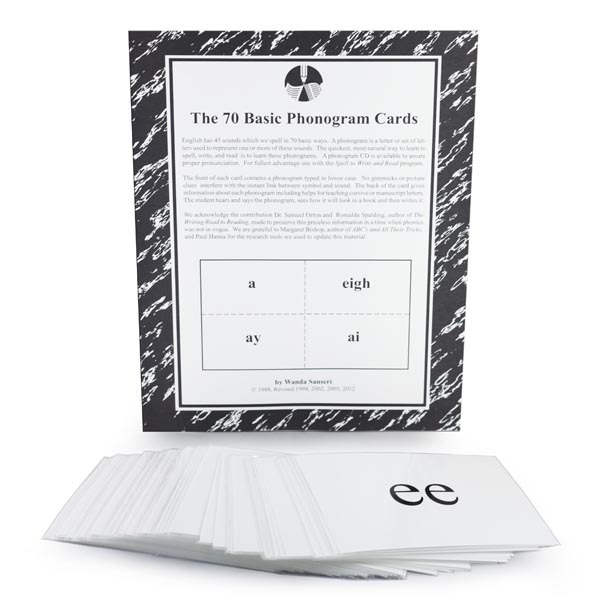 If you’re planning on using Cursive First separate from SWR, you’ll need the phonogram cards. See our Cursive First FAQs page for more information on why we recommend this. This audio CD helps you learn the phonograms so that you can teach your students correctly. Your student can listen along to the CD as well. Together with the 70 Basic Phonogram Cards, this CD completes your Cursive First package. Another option to purchasing the CD is to download the SWR app (available from Google Play or iTunes) for your mobile device. Listen to an interview with Liz FitzGerald by Hank and Sherry Osborne of Homeschool Support Network on the topic of teaching cursive first.